We’d love your help. 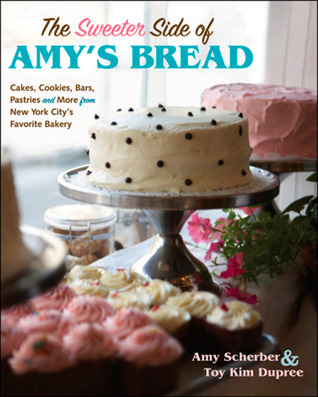 Let us know what’s wrong with this preview of The Sweeter Side of Amy's Bread by Amy Scherber. To ask other readers questions about The Sweeter Side of Amy's Bread, please sign up. I bought this book on the strength of "Amy's Bread". It was just as good. I'm an experienced and excellent chef but I've only been a baker for a few years - and even then only of bread. I really like the recipes; they're clear and not hard to follow, and these are a bit simpler than the bread recipes. Having never made cakes, biscuits, bars I have tried several recipes - Carrot Cake, Monkey Cake and one of the bars - delicious. Loved the anecdotes about staff and customers. Haven't been to New Yo I bought this book on the strength of "Amy's Bread". It was just as good. Loved the anecdotes about staff and customers. Haven't been to New York in years and years but if/when I go I will definitely visit her bakery. I love baking bread and have felt a bit stuck on some of the issues I've had in baking certain breads. This book has a lot of great info on tips and tricks to get some great crunchy bread from your own home. It gives ideas on how to recreate the stone oven baking with your own stove. Now I just want to go to NYC to have some of their fresh bread! I bought this off the clearance shelf on Amazon.com. I was not disappointed. I have yet to make anything I haven't loved. My favorites are the Apple Walnut cake (hands down) and the Blondies. My sister and I are baking our way through the book and one of her favorites is the Cinnamon Raisin Twists. Just didn't grab me - don't know if it was the layout of the book, or the recipes, but there was not a single thing in this book that I wanted to make.